LG G4 rumours are beginning to heat up, but the last few weeks have been mostly dedicated to one big debate: will the full metal uni-body will remain? A new leak from the XDA Developers forum has shown off the first images of the handset with the metal uni-body design still intact. All in all it looks quite similar to the LG G3 with the power button and volume rocker on the back of the handset, just below the camera. Notably the rear camera has a square sensor this time around with the power button switching to a rectangle as well visible in between the volume rocker keys. The big change is in the top left of the back which looks like it may be a stylus – if it is the source hasn't supplied any photos of the stylus unsheathed. Separate sources in Korea have suggested the LG G4 will feature a curved display like the LG G Flex 2 but these photos suggest otherwise. Be sure to take these snaps with a massive pinch of salt though, we don't know exactly what the phone will look like until we officially hear from LG. 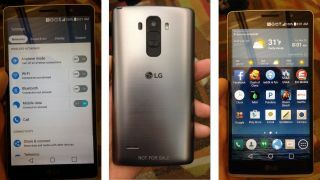 Finally, another new rumour has suggested the LG G4 will be launching at the end of April this year. The news comes from a variety of industry sources known to Korean media (via G for Games), which sounds promising. Here's a look at everything rumoured for the LG G4 so far.